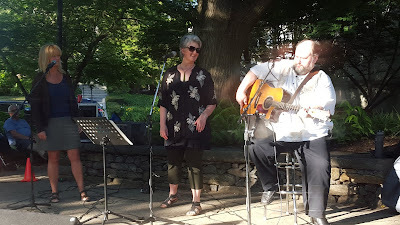 Lindsay Gilmour (center) and Jim Fogarty (right) perform for a large and mellow crowd on June 14, 2017 at Ned Wolf Park. Guest vocalist, Melissa Martin (left) added great vocal harmonies to complement the husband and wife duo. Perfect weather with a gentle breeze made our park feel like it was made to host such crowd-pleasing entertainment. Next week, an especially family friendly concert meant to have the kids up and dancing - Music with Gina.